Homemade stuffing is a fall favorite thanks to ground sausage and savory spices. If you have never learned how to make stuffing and instead resort to a bag, don’t! 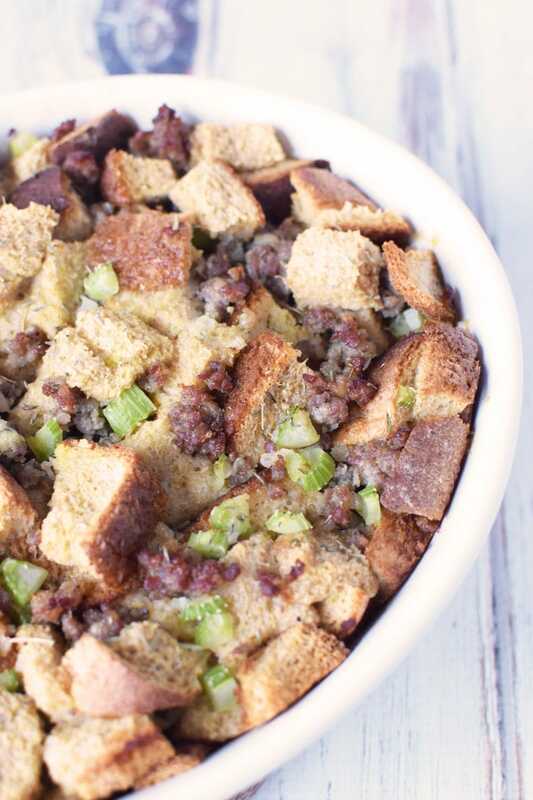 This easy homemade sausage stuffing recipe is so delicious you may forget you have never made it before. Admittedly, stuffing hasn’t always been my favorite. Soggy bread? Um, no thanks. But making stuffing from scratch can really change your opinion and having this homemade stuffing side dish on your table is a must; especially if grandma is coming into town. Easy to make, this homemade stuffing recipe should not scare you at all. 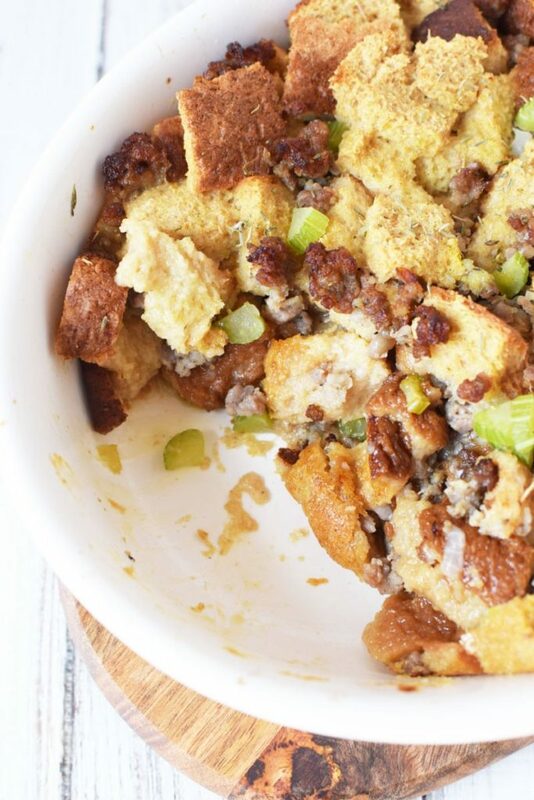 Plus, you can easily alter the bread with your favorite, making it your own stuffing recipe. And with only 20 minutes prep to oven, it doesn’t take much time or skill to get started. Homemade stuffing makes a perfect side dish. You can plate this up or even pre-make and shove in a turkey! 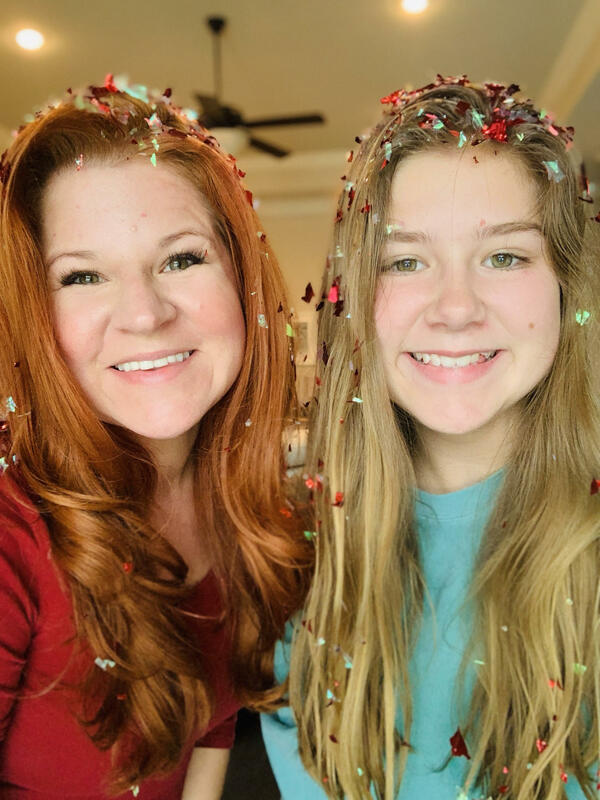 Sorry everyone, this stuffing recipe is not low carb or keto friendly! Whomp, whomp. Tips: Need more fall favorites for your dinner table? Don’t leave without homemade green bean casserole and sweet corn casserole to round out a classic thanksgiving table. Plus my friend Karen over at The Food Charlatan has this amazing macaroni and cheese recipe that’s out of this world! Preheat oven to 350 and grease a casserole dish or 13×9 baking pan with nonstick cooking spray. Set aside. 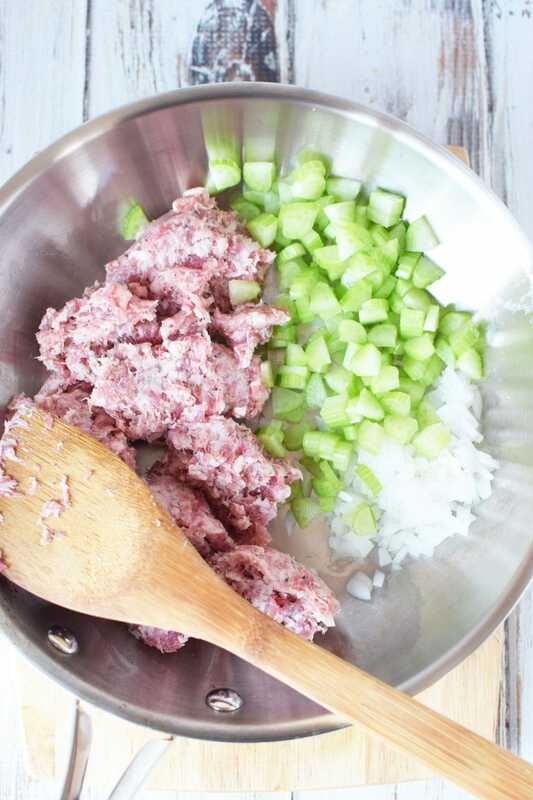 In a large skillet, add butter, sausage, onion and celery. Heat on medium heat, stirring frequently or until sausage is browned. 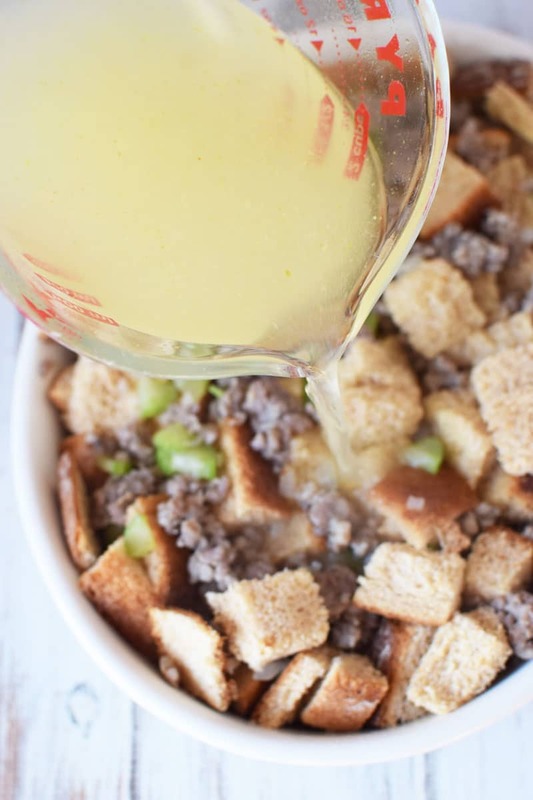 Using a bread knife, cut bread into 1″ cubes and place into a large mixing bowl. Add sausage mixture to bread and mix well. Pour broth on top of bread making sure to coat all pieces. If necessary, push bread into the dish with the back of a spoon to absorb the broth. Preheat oven to 350 and grease a casserole dish or 13x9 baking pan with nonstick cooking spray. Set aside. 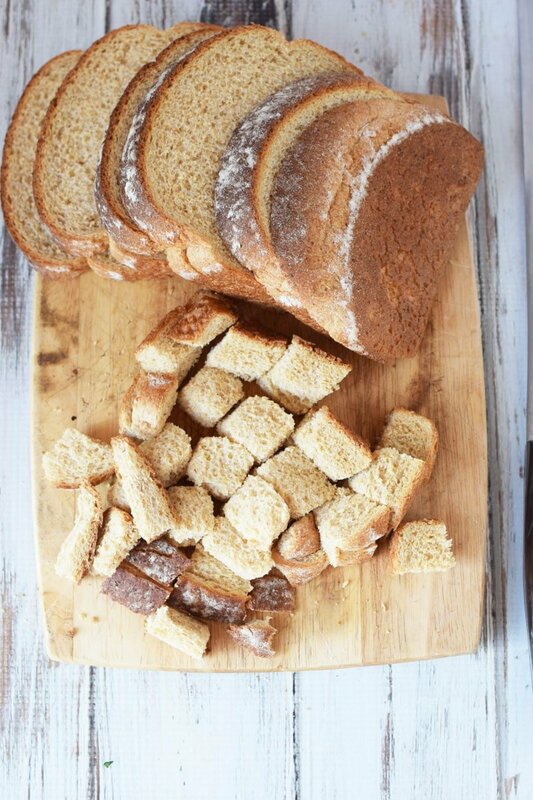 Using a bread knife, cut bread into 1" cubes and place into a large mixing bowl. Add seasoning and mix well. 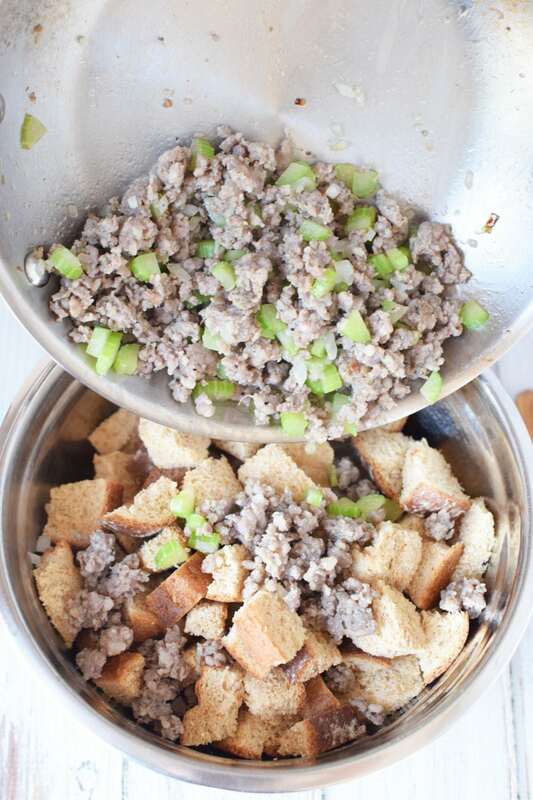 Add sausage mixture to bread and mix well. Pour into prepared dish. Pour broth on top of bread making sure to coat all pieces. If necessary, push bread into the dish with the back of a spoon to absorb the broth.